Soroush Richard Shehabi has two decades of experience in media, law, policy and politics, with expertise in energy/environmental security and U.S.-Iran policy. Mr. Shehabi graduated from Harvard University (Class of 1987) where he obtained the support of Professors Joseph Nye and Stanley Hoffmann and the approval of the Faculty of Arts and Sciences to establish a new interdisciplinary concentration in International Relations and Environmental Policy, earning High Honors for his thesis on Global Environmental Security. Mr. Shehabi then worked as a financial analyst for Salomon Brothers in NYC, focusing on the financing and acquisition of pollution control technologies, before attending law school at the University of California, (Hastings, JD, ’94) and joining the law firm of Christensen, White, Miller, Fink, Jacobs, Glaser & Shapiro in LA. Mr. Shehabi was then recruited by the Untied States Department of Justice during latter half of the Clinton Administration, where he served as a U.S. Trial Attorney for six years in DC. 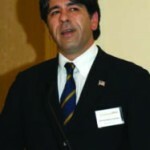 Mr. Shehabi’s experience in politics started with Sen. Gary Hart’s 1988 presidential bid, continued with Vice President Gore’s 2000 campaign, and culminated in roles as a Senior Policy Adviser for General Clark and Deputy Political Director for Senator Kerry in Pennsylvania during their 2004 presidential campaigns. The Council on Foreign Relations selected Mr. Shehabi as a term member in 2000, where he participated on panels and task forces in a variety of policy areas including, global environmental security/climate change, energy policy, genetically modified foods, immigration and civil liberties, and U.S.-Iran Policy. He is also a founding board member of the Iranian American Bar Association and the Iranian American Political Action Committee, which he helped merge with the Public Affairs Alliance of Iranian Americans in 2008. Most recently, Mr. Shehabi has served as CEO of Washington Life Magazine as well as a Principal in a 70-year-old business-to-business media information service company which he and his partners acquired in 2007. He speaks Persian and French and is passionate about documentary films, most recently bringing together a distinguished group of Washington-based business leaders to produce “Kicking It,” which debuted at the Sundance, Tribeca and SilverDocs film festivals before being sold for theatrical and international television distribution.